Over the past two days, I’ve received numerous calls of herbicide carryover injury from applications of herbicides that contain fomesafen last season. Fomesafen is the active ingredient in the herbicides Dawn, Flexstar, Flexstar GT, Prefix, Rhythm, Marvel and a variety of other generic products, and in recent years has become one of the most common active ingredients applied post-emergence for the control of glyphosate-resistant waterhemp in soybean. Of the herbicides that we typically apply postemergence in soybeans, fomesafen is one of the most persistent and has one of the longest periods of soil residual activity. Because of this soil persistence as well as the sensitivity of corn to fomesafen residues, the label of most fomesafen products like Flexstar and Prefix requires a 10-month rotational interval between fomesafen applications and corn planting. For some of the calls and complaints I’ve had this week related to fomesafen carryover, this 10-month rotational interval between application and planting was not followed. However, in some of these instances, there has been more than 10 months elapsed between application and planting. 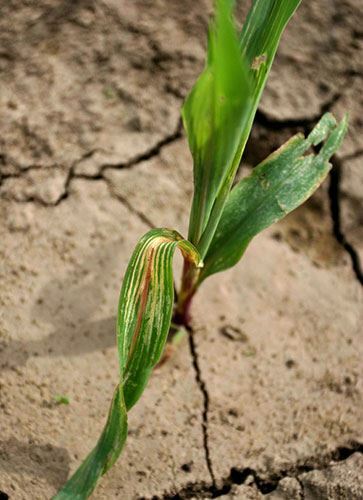 There are two primary factors that influence the likelihood of fomesafen carryover injury to corn; 1) dry conditions following application, and 2) the rate and timing of the herbicide application. I also think that we should consider the impact of our colder-than-normal winter on fomesafen carryover. I can’t find any research data to support this, but it makes sense to me that microbial degradation may have been reduced in response to the extended winter we just experienced. There’s no question though that the number one factor that influences the likelihood of fomesafen carryover is precipitation between application and planting. Soil moisture is critically important for herbicide degradation. If adequate rainfall is not received after application, then the chemical and microbial processes responsible for herbicide degradation are reduced significantly and the herbicide molecules are more likely to become bound (adsorbed) to soil particles. All of this results in less herbicide degradation and increases the likelihood of herbicide carryover. Injury may also be more noticeable on sandy soils, as these areas are usually better drained and hold moisture for shorter periods of time. In some of the locations that have reported fomesafen carryover this week, precipitation totals have been off by as much as 17 inches from the 15 year average for the time period following application to now. The rate and the timing of the fomesafen application are two other factors that influence the likelihood of carryover injury to corn. Simply put, the higher the rate of fomesafen applied and the later the herbicide application was made, the greater the chance that some fomesafen may remain to cause carryover injury to corn. Since the labels of most fomesafen containing products require a 10-month rotational interval between application and corn planting, late-season applications of these products in soybeans and early planting of corn the following spring can often make satisfying these intervals difficult. 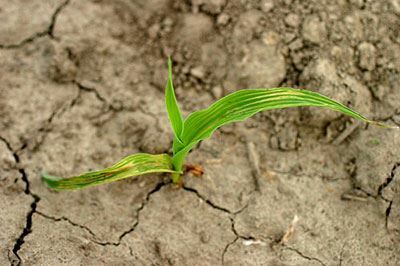 The most common corn injury symptom caused by fomesafen carryover is a whitening of the leaf veins, commonly referred to as veinal chlorosis (Figures 1 and 2). Affected areas of corn leaves often take on a striped appearance, can become necrotic, and tissue near the leaf midrib may totally collapse in that region. The root system of affected plants usually remains normal, and plants can take on somewhat of a “droopy” appearance as well. soybeans the previous season, and dry conditions following application.